One of our passport case. Yeah, I know. The title doesn't funny at all. It's already September. The only September-related song title that I remember was this Green Day's song. And we like to bake any kind of cake. Also "bake" and "wake" have similar sounds. But this is not what I want to write. The thing that we really wanted to tell was about our newest collection. The September collection. 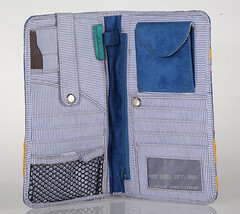 Besides the usual wallets, in this collection, we also have three passport case. The passport case has one big zippered compartment, eight card slots, one coin bag, and all of this handy keepers are wrapped with the most loveliest hand embroideries that ever exist in the history of humankind. You might notice that the photos from this collection are quite special. We got a tremendous kindness and talent from our pal, Edwin Roseno. We uploaded all of the photos from this collection on Flickr. But you can also check the product section in this blog or log on to Facebook and show your love to Simalakamma's page. We'll meet each other again when we have another interesting thing to write.